It has been eighteen months since I have posted on this blog. My hiatus away from blogging has been longer than originally planned. Now I am ready to reoccupy this space with a different voice as a writer. I have learned how to embrace the truth about my womanhood. I am an aging Black woman. This is the perspective that I have been learning how to focus on during the time that I have not been posting here. Writing from this perspective is new for me. I am honest enough to admit that it is also a challenge because of the growth and development process that is occurring in my life. 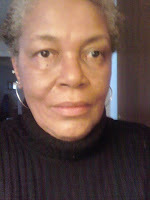 It has not been easy shedding the identity that clothed my womanhood prior to turning sixty. That is a woman who had defined interests, passions, and a professional identity all of which were very comfortable to me on so many levels of my life. Learning to accept the changes that have occurred and that are occurring has not always been easy. I have had moments when acceptance has been hard to embrace because it signals the end of an era that I have moved through. There are identities attached to my Black/woman/self that are still fairly new and not fully defined. Hopefully as I work on sharing my story those definitions will become clearer to me. This is the shift that From My Brown Eyed View will be making in the upcoming months. I hope that you will join me in this adventure. Together we can make discoveries about ourselves as older women. Share information that can help support each other during this phase of our life.